Beach Head’s real name is Wayne R. Sneeden. He was born and raised in Auburn, Alabama, living in abject poverty; this led to him being bullied and tormented by his classmates and peers throughout his growing years. In hopes of becoming more than what those taunted him believed he could be, Sneeden became an overachiever and ended up the valedictorian of his high school through hard work, unwavering discipline, and his keen mind. Sneeden? That last name is too perfect. It just conjures images of Alabama backwoods kinfolk out of thin air for me. I also feel that someone with the last name of Sneeden has a better-than-good chance of being arrested for running a shake-and-bake meth cooking operation out of their Ford Bronco. In other words, the fictional Wayne Sneeden is lucky to have escaped into the arms of the U.S. Army and Team Joe with all his teeth … or did he? What lies under the green mask? I’d be afraid you’d pull it off to be greeted with AAAAAAAKKKK!!! black-and-yellowed teeth the size of corn niblets! Seeking the next challenge, he enlisted in the US Army, where he went through Airborne and Ranger school Ft. Benning, Georgia. After he completed training there, he went onto join Central America’s Covert Ops as an Observer/Advisor. After his training in Central America, he returned to Ft. Benning as a lane instructor. And who was Beach Head fighting against? There was also that group of baddies with the ruthless terrorist organization Cobra called the “Crimson Guard.” They were told what to do by twin circus freaks riding a four-wheeler. Were their names Nabas and Saban? I can’t recall exactly. But that sounds about right. 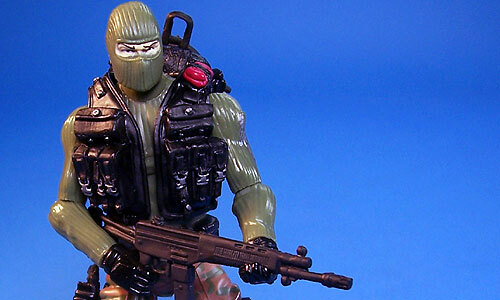 Beach Head was my favorite Joe when I was a kid just because of this. I remember being incredibly excited when I first saw Auburn listed as his hometown on the bio card. As a reader of the comic book I can also tell you how disappointed I was when Grunt retired from G.I. Joe and returned to civilian life as a student at (gag) Georgia Tech. Ha ha! I guess I can see Grunt going to GT. I stopped reading the comic about the time of Cobra Commander’s death (or maybe he didn’t really die … I didn’t keep reading). But I loved the Marvel comic too. He didn’t die! He went on the run with Destro and discovered his long lost son. That’s about the time that I stopped reading it as well. Event at 11 years old I knew a goofy story line when I saw one. How I remember this from a comic I haven’t read in nearly 24 years is beyond me. You made me all nostalgic, and when I get nostalgic I just gots to google. Looky what I found. Outside of Rogue from the X-Men (Mississippi), there has never been a single respectable non-overly-stereotyped superhero from the South, ever. And Gambit and Brother VooDoo and all the other extremely Cajun heroes hailing from the deepest swamps of Louisiana don’t count, either. That’s a good point about no non-stereotyped superhero characters from the South. Now I feel kinda guilty that none of my own characters in my semi-popular superhero novel series are from the Deep South– though their HQ is in Virginia, if that counts anymore. Foy Onion — That is awesome. I think I had a little card file to keep mine in too. AubOrange — That’s a good point. I can’t think of any either! Van Plexico — You, sir, are a Renaissance Man! Wow. I’ll have to check out all your various sites and projects. Nice video. Beachhead throws a mean bomb (yuk, yuk). It’s a shame he went straight into the Army, ’cause Pat Dye coulda used a QB with an arm like that. It’s Tomax and Xamot dude! As a life-long Auburn fan, I’m proud to say that I own an unopened Beachhead action-figure from the 25th Anniversary line. When I saw him hanging in WalMart next to a large crystal football, I knew I just couldn’t leave an Auburn man behind. AubOrange- Bart Allen (The Flash) was from Alabama. I don’t remember exactly where, though. folks should start wearing that mask at games next year.